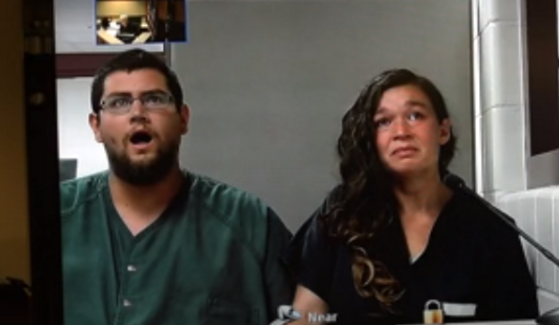 Conservative Christian parents who ‘relied on God’ and dismissed doctors as 'priesthoods of the medical cult' reacted in shock as they heard the murder charges brought against them after the death of their 10-month-old daughter. Mr Seth Welch and Ms Tatiana Fusari from Cedar Springs were indicted of felony murder and child abuse facing a possible life imprisonment. Mr Welch and Ms Fusari, were at first just brought in for questioning during which they admitted that their daughter was quite skinny and underweight. Related coverage: <a href="https://thegoldwater.com/news/33249-Michigan-Move-Over-Uber-Here-Come-The-More-Scenic-Horse-Buggy-Rides">Michigan - Move over Uber, here come the buggy rides</a>. The couple has two older children together, aged 2 and 4. They have currently been placed with their grandparents. They should have moved to England where the Government has made it legal to kill treatable children. Further proof that there's no such thing as 'God', and anyone who believes in that concept is an idiot. You left your fedora on your way out of reddit.com be more careful lad! christcucks are retarded, but at least they're not vaxxcucks. I guess the mother didn't breastfeed enough?